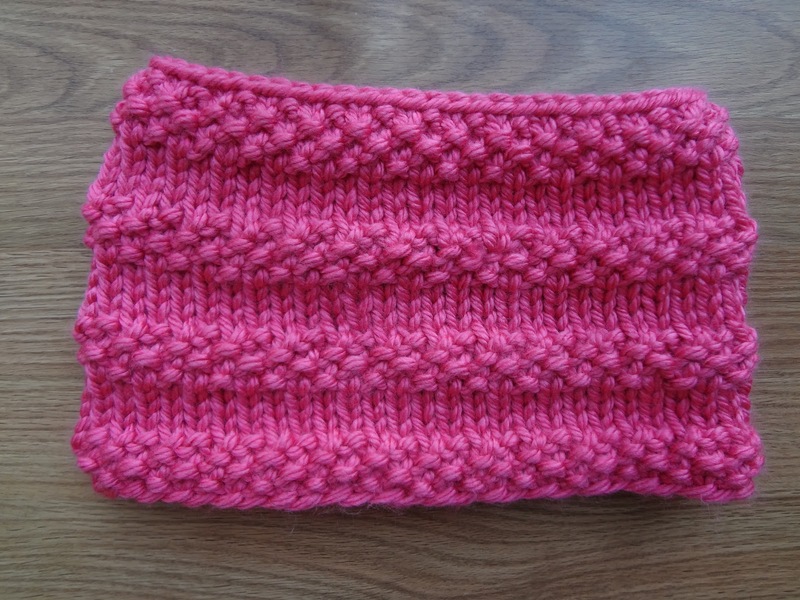 Fiber Flux: Free Knitting Pattern...Bubblegum Cowl! 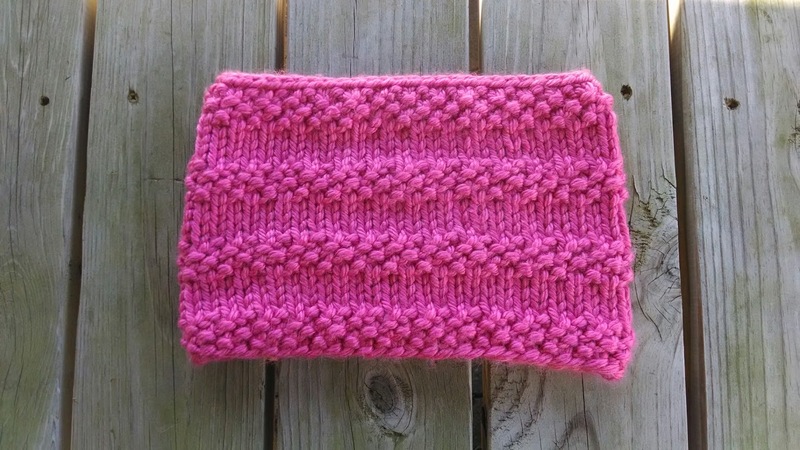 This cowl is suitable for both kids and adults alike. 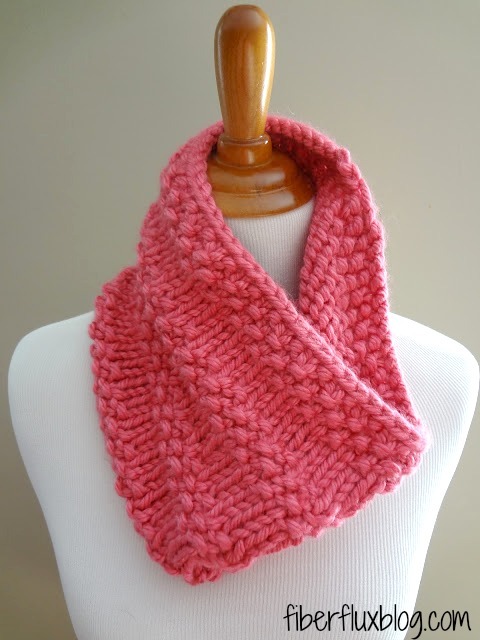 Knit with chunky bubblegum pink yarn, it is a super fast project to make for yourself or for a quick gift. It is perfect for those late winter and early spring days when you want a bright pop of spring color, but need to still be warm and cozy. 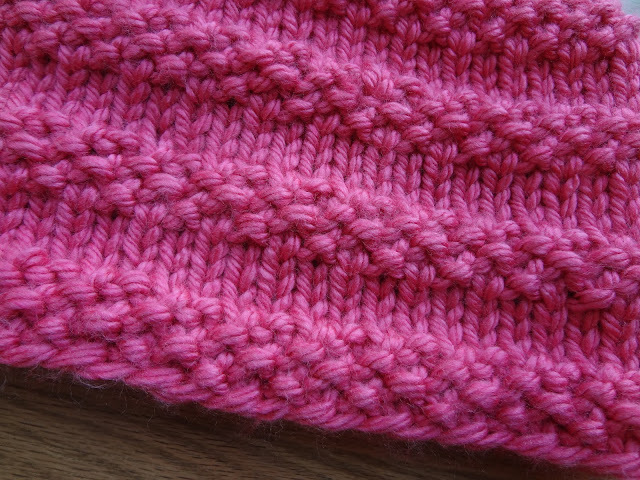 This cowl is knit in the round from the bottom up with alternating bands of stockinette and seed stitch. 1 Skein Lion Brand Hometown Solids in Honolulu Pink--this cowl takes exactly one skein not including the gauge swatch (Note: If you choose to use some of the tweeds and prints in the Hometown line, be sure to check the yardage, some of them are only 64 yards, so you'll need more than one skein). Repeat rows 1-8 two more times, then repeat rows 1-4 once more. BO and weave in ends. Jennifer! I love this! Thanks for sharing love all your designs. Thank you so much for your sweet words! I really appreciate it! It would be if the cowl was knitted flat, but because it is knitted in the round, each round has to be knit on the circular needles in order to achieve the stockinette portion of the cowl. Just made your Bubblegum in a nice purple--and LOVE it!! I will be making 5 more to give out to my walking buddies--less than one hour to knit! Sounds great in purple! Your walking buddies will be so excited!! Yes! Thanks for letting me know...I am working on removing the "print" button, it seems to be more trouble than it is worth. It just takes forever because I have to manually remove it from each post...sigh! In the meantime you could highlight the text that you need and right click with you mouse, hit copy, then paste it to a word document...that way you have only what you need and you can save it too...hope that helps! It is so cute. I think I found the pattern for my holiday gifts. Thanks! Super fast for gifts, I made a few too! I tried this with the yarn suggested and I came up way short. I am also a tight knitter. I only made it through the first 4 rows of the 3rd repeat. I then tried to bind off and I ended up not having enough yarn. I will either have to frog the whole thing or buy another skein. Otherwise it was knitting up quickly. I also ran out of yarn. I CO 53 so there would not be a repeat in the seed section. I ended up only doing 3 stockinette stitch rows in between the seed rows and I had barely enough yard. I checked gauge and needle size. Maybe I got a bad skein? I also ran out of yarn and had to make it a little bit smaller because of that. Here I bought 8 skeins of the yarn in different colors, planning to knit up a number of these. What do you suggest? Do you have any other patterns that would use one skein of this type of yarn? Help me please!!! I did a little research and found that some of the prints and tweeds in the Hometown line have a different yardage than the solids. The solids measure 81 yards and the tweeds and prints measure only 64 yards. Maybe it could be that? I updated the pattern above with a special note too for others making their yarn selections. I hope that helps! Do you bind off using knit or purl stitch or the k1,p1 seed stitch. I did this bind off using the knit stitch, you could also do it in seed, that would look great too! Yes! Check out the "free knitting patterns" tab and the "free crochet patterns" tab. In knitting there is also the Spice Cowl and Strawberry Jam, and in crochet you can check out the Butternut Squash, the Key Lime, the Meringue, and the Cloudy Sky Mobius. Hope this helps you! Hi thank you for all your free patterns i really appreciate it because i started knitting When i was 9 and now i am 12 so it is nice to have free patterns if you no what i mean. i am going crazy over making hats i am just spouting then out it is really nice and i am also doing baby booties cowls scarfs and much more. I like making hats for little kids because i can do more cute things because some adults are plain jane. i am also making my one creation hats and selling then along with cowls so it's fun .I think knitting is the best hobby ever you can make things that you can use it gives you a sense of accomplishment it is also great to give a hat to little child as a gift or to their mom and it is so nice to see them so happy or the twinkle in their eye it does me so good. You're welcome, thanks for your kind comment! Any chance you have this pattern written to knit flat??? That is a great idea! I will work it up and post it tomorrow so you will both have it, that way there will be a version of each. Thanks for your comments! If I wanted to cast on 108 to make it more like an infinity scarf, would that work? Will casting on this many stitches fit on a standard straight needle with a bulky yarn? It would if your needles are long enough, I definitely wouldn't recommend using anything too short, as the stitches would want to jump off the edge. I would lean toward using a 14 inch length. Yes I would also like to try and knit it as an infinity scarf, and wondering how many stiches I should use? Many thanks! I just made this today as my first project in the round! Thanks for the great pattern! Neat! So glad you like it! Hi Nancy, are you using the same needles/yarn as in the pattern? Could you please tell me what "PM and join in the round" means? I normally would have joined in the first line of the directions. I haven't been knitting much the past 20 years! Thanks! Sure "PM" just means that after casting on, place a stitch marker on the needle, then begin your round by working the first stitch. Love that I found this was wondering if you've made this for a toddler and what wd u cast on using circular needles? 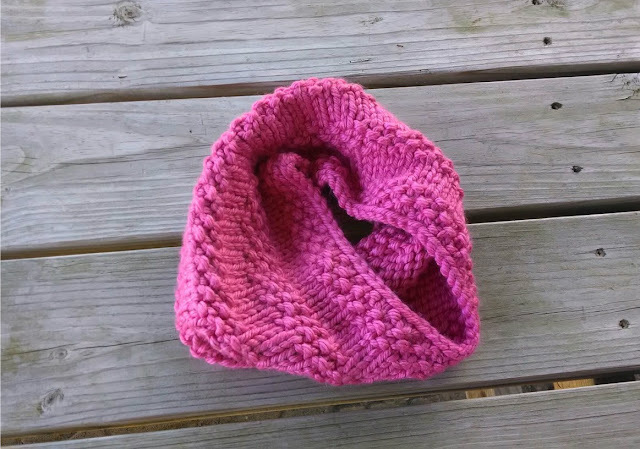 My nieces daughter is going to be (3) and have been working on a hat and have been looking for the perfect comfortable looking cowl for a little girl....this looks perfect. Any thoughts for the cast on? Thank u....love your site! You could make this for a toddler, this pattern is worked in seed stitch/stockinette, so any even number cast on...just as long as it is an even multiple. I have loads of worsted weight wool to be used up can I use this wool? Thank you - I made 8 this year as gifts! Quick and easy, love the Lion Brand Hometown yarn. I used another brand (Bernat) for a few, but preferred Lion. Love this quick and easy pattern. The first one I made with Hometown New Orleans French Berry and didn't have enough yarn in one skein to finish the pattern, even though my knitting was tight. I made a second one in Dallas Grey and had a perfect amount of yarn. Maybe some of the skeins are short? That is a great point you brought up...some of the prints have a shorter yardage...while I made the one shown in a solid color, I will add that info to the pattern page so others can be aware too. Thanks!!! I'd love to make this project using the Red Heart Boutique Magical !!! It'd be super cute. I want to thank you for this easy pattern for the beginner knitter. You have explained the pattern quite clearly and it is just an adorable cowl. I will enjoy making one for myself. I hope you have a nice winter. Working on my first one. I used the Minneapolis purple color and ran out of yarn last night- still had last 4 rows to do. Will stop on the way home from work today to buy some more. The yardage said 81 on the skein- who knows? At $4.99 a skein it is not too bad- I will use the yarn for another one. Thanks- I just took up knitting after a long hiatus. My first try at a circular knit- very easy- great instructions. Sham we can't post pictures of our sucesses! Hi! I just pinned your beautiful cowl! Unfortunately, I'm having a hard time finding 16" circulars, let alone US 15, except the bamboo kind. I find these are harder to work with on synthetic yarns and wools. I was wondering if you used metal needles and if so, where you purchased yours? I see so many great patterns, but find that it gets costly buying so many different kinds of needles (straights, circulars, etc.). Thanks in advance for the advice! Hi- Still wondering what kind of needles you use (aluminum or bamboo)? And where to find them? I am new to knitting and all of your patterns are great. I am making a lot of cowls and easy afghans. Thank you for making my evenings enjoyable. Great Christmas gift too. Love this! I'm always looking for circular needle patterns, and this one is perfect. I'm going to bring this to jury duty next week (sigh) and I'm sure it will keep me occupied while I wait--thanks! the 'print friendly' option does not allow creation of pdf download as do your other patterns. Can this pattern be done on a knitting loom? Can this pattern be made on a knitting loom? Thank you for a lovely pattern. A very fast knit. I made one this evening. Thanks for sharing this eye-catching pattern. I love seed stitch but had never (!) thought of using it as a stripe. Couldn't find the right length size 15 circulars so I used ratios (yay girl math)and did on size 8 needles. Have enough yarn from a jumbo skein for a matching hat.